After the L.A. Lakers won game seven of the 2010 NBA Finals over the Boston Celtics to capture their second title in a row, Ron Artest conducted a free flowing post-game press conference. He candidly admitted that the pressure of a close game could negatively affect him and he thanked his therapist for teaching him how to relax in such situations: "Usually I am not good at these moments and I know that about myself. So, what do I do to be good at these moments? Figure it out. I needed some type of way to relax during these moments...I just trusted everything that she told me as far as relaxing and, bam, the big three goes in." There should not be a stigma about seeking help from a therapist and Artest's willingness to be open about his struggles hopefully provides strength to other people facing similar struggles. provides some answers. Powell begins, "What about the demons? Well, they never really left him. They hibernate and lurk and stay on standby. Lord, how those demons created a mess for him. At times they nearly stole his soul, although it is the now-retired Artest who is winning that war. He's moving forward--triumphantly and surprisingly so, you soon learn--while never too embarrassed or hesitant to survey what he left behind." Artest is candid about some of his past behaviors/misbehaviors: "Showing up to practice and disrupting practice, showing up a coach or a teammate, just going over the line. There's a lot of things I wish I had done differently. But maybe I couldn't at that time. I felt trapped." Artest's battles with anxiety and depression began during his tumultuous childhood: "I always had anger issues because that's all I grew up around, anger. I also had love and that's why people see two sides from me. I saw my parents happy and mad. I grew up with friends who were happy and the next moment guns were firing. As a kid it was unbalanced and confusing. There was never a chance to relax. It was just get up and see what's going to happen today. I might have a good day. I might wake up on the other side of the bed. I was suspended in nursery school, kindergarten, first through 12th grade every year for fighting. In college I got in trouble and in the NBA I was in trouble for something or another every year except my last year." A domestic violence conviction in 2007 forced Artest to seek the counseling that he had long needed, and he has been in counseling ever since. Artest recalls, "I was the best two-way player in the league at 24. I was also spiraling downward emotionally. My emotions were eating away at my skills. Like a parasite eating away at your body. It was eating away at my skill and my work habits and my mental focus and my discipline. Before I got into the brawl I wanted to retire. I requested papers to file to the NBA. I knew something was terribly wrong and nobody really knew. The league called and asked if I really wanted to do this. I needed time away because I couldn't get a hold of myself. There were so many things bothering me, so many things I couldn't handle: Taking care of so many people, wanting to have fun, not being a loyal partner with my now ex-wife … I said, 'OK, I need a break. I need to put my life in order.' I didn't go through with retirement but I wish I did. It wasn't about the money. I was going crazy by 2008." It is a fallacy to assume that money, fame and popularity insulate a person from the effects of mental illness; if anything, those three things can both exacerbate and cover up deep-seated issues. Artest put his money where his mouth is: he donated his 2010 championship ring, with the raffle proceeds of $651,000 earmarked for mental health charities. He also helped put his brother through law school and he set up a division in his company to help athletes with tax preparation. If all you think about when you hear the name Ron Artest is the "Malice at the Palace" brawl, then you have missed the point. Artest is an example of what can happen when a person acknowledges mistakes, seeks help and strives to become a better person. For information about finding a therapist near you, go to BetterHelp. 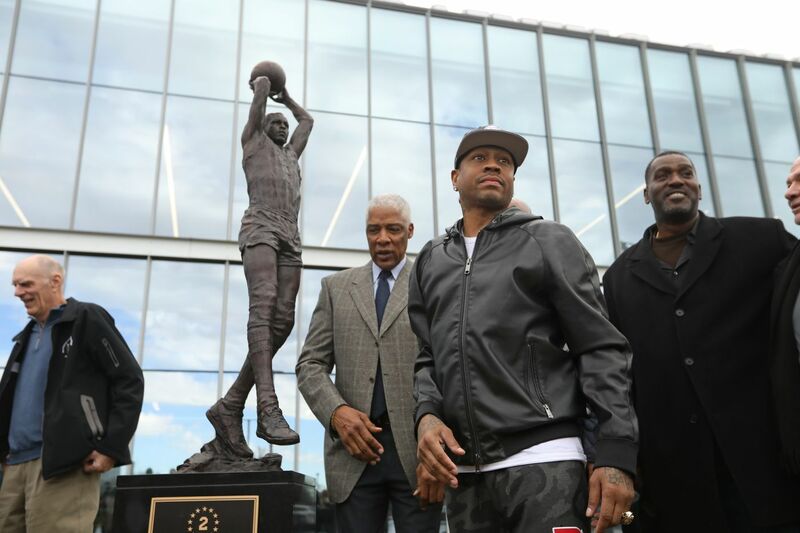 Here is a picture of the banner, and a picture of the statue, with (left to right) Bobby Jones, Julius Erving and Allen Iverson among those present to pay tribute to Malone. Malone passed away in 2015 but he would be happy that the team remembered and honored his one condition about his jersey being retired. Malone's request speaks volumes about the kind of person and teammate he was. Michael Lee wrote a nice story about Malone's career and the ceremony and some of the quotes in that piece provide meaningful context about one of the most underrated great players of all-time. His Philadelphia Coach, Hall of Famer Billy Cunningham, said, "Moses Malone is as smart a basketball player that I've ever been around." Pat Williams, the general manager who brought both Julius Erving and Moses Malone to Philadelphia, described Malone's style of play: "He wasn't beautiful. He wasn't graceful. He just outworked people. Out-hustled them. Went after every rebound. Never backed down. And we haven't seen that type of player ever again, probably never will." Maurice Cheeks recalled Malone's sense of humor; after a game during which Cheeks only made one shot, Malone quipped that he should have at least made two so that people would not assume that the one was just a lucky shot. Unlike many of today's superstars who incessantly seek out the spotlight and demand that they are recognized as "The Man," Malone--the reigning (1982) MVP joining a Philadelphia team led by the previous (1981) MVP Julius Erving--quashed any hint of that nonsense with a simple, direct statement: "This Doc's team." Malone deservedly won the 1983 regular season MVP and the 1983 Finals MVP as the 76ers rolled to 65-17 regular season mark and then went on a record-setting 12-1 playoff run, but Malone let his play speak for itself as opposed to running his mouth. Malone and Erving each earned All-NBA First Team honors, and Erving finished fifth in MVP voting. They provided the blueprint for the way that two all-time great players should share the spotlight and the glory while leading their team to the top; it is a shame that they did not get paired together a few years earlier (Erving turned 33 during the season that Malone joined the team) or they might have won several championships in a row. Instead, they enjoyed one dominant season together, plus a strong push to the 1985 Eastern Conference Finals that ended with a defeat at the hands of the younger Boston Celtics, who were in the midst of a run of four straight NBA Finals appearances. For a variety of reasons that fall outside the scope of this article, it is difficult to determine which basketball team is the greatest team ever but Philadelphia's 1983 championship team takes a back seat to no single season squad in pro basketball history; that does not mean that they are definitely the best, but it means you cannot point to a single team that is clearly better. Malone was the dominant force on that dominant team, along with the incomparable Erving, and it is fitting that the 76ers honored not only Malone's greatness but that they did so in keeping with his wish to recognize all of his teammates as well. Last night, Kevin Durant's post-game press conference primarily consisted of an anti-media rant, with the two primary themes being (1) he does not trust the media to provide accurate coverage and (2) he does not see how talking to the media will help him do his job better. Durant is right regarding point one. When I covered NBA games on a regular basis, I witnessed reporters who would go to one locker room, ask a leading question to a player and then go to the other locker room and tell a player, "Player A said X, Y, Z. What do you think of that?" The reporter did not tell the second player that the first player's comments--usually paraphrased to change the meaning--were not just a random statement but were in fact an answer to a question from that reporter! Other reporters asked questions that betrayed complete ignorance of the NBA game and/or had no meaningful connection to anything that is relevant. Not all reporters and media members are deceptive and/or incompetent but many of them are; they create "news" instead of reporting facts. If I were Durant, I would not want to talk to them, either. As a competent journalist, I often found that I had to overcome the default assumption by players/coaches/scouts that media members do not know what they are doing or, even worse, that media members have a negative agenda. Only after I proved that I know my stuff and that I was working on a legitimate project would they open up. Regarding point two, Durant is correct that talking to the media will not help him play basketball better. Unfortunately for Durant and other NBA players, part of their job is dealing with the media, because the media provide access for the fans. Without TV and internet coverage, the players would not make the salaries that they make. Durant has justifiable complaints but instead of ranting he should simply be careful and reserved with the answers that he gives and he should only provide in depth responses to media members who have proven their competence, ethics and reliability. I interviewed Durant early during his second year and he unhesitatingly provided thoughtful answers to my questions. Sadly, if I were to approach him today he probably would not want to be interviewed at all, unless he happened to remember me from more than 10 years ago. Some media members do a great job. It is always informative and entertaining to listen to Frank Isola on Sirius XM NBA Radio's morning show during the week; Eddie Johnson provides a great ex-player's perspective on that same channel during a different show. Other media members are outstanding as well, including Roland Lazenby, the longtime Lindy's Pro Basketball editor who has written definitive biographies of Jerry West, Michael Jordan and Kobe Bryant. Unfortunately, the media members who do a poor job make it more difficult for the competent media members to get access and continue to do their work. For at least 25 years or so--ever since it supposedly became too "boring" to vote for Michael Jordan to be the NBA regular season MVP--I have often not agreed with or even understood NBA regular season MVP voting. Sometimes, the narrative is that the best player on the best team should win, even if that player is clearly not the best all-around player in the NBA. Sometimes, we are told that a player whose team does not rank in the top four in his conference is automatically disqualified no matter how well he plays. Other times, we are told that the best player should win regardless of team success. Basically, the qualifications seem to shift depending on which narrative is preferred by the majority of the media members who have MVP votes in a given season; they decide who they want to win, and then choose to hype the narrative that best matches their choice. My take on MVP voting has consistently been simple and direct: the MVP should be the best all-around player in the game, with the only exception being if there is a player who is so dominant in one or two areas that he is more valuable/impactful than even the best all-around player; that caveat is how I would justify awarding multiple MVPs to Shaquille O'Neal, who was never the best all-around player but was for a period of time the most dominant player. Team success can be a consideration or perhaps a tiebreaker in an otherwise close race but the problem is that team success depends on many factors that cannot be controlled by just one player. I agree with Kenny Smith's oft-repeated statement that one has to be wary of a "looter in a riot," a player who is amassing gaudy statistics while playing for a bad team, but it is not often that such a player gets serious MVP consideration anyway. By my reckoning, over the past 20 years or so Shaquille O'Neal, Kobe Bryant and LeBron James should have won more MVPs, while Allen Iverson, Steve Nash, Dirk Nowitzki, Derrick Rose and James Harden should have won fewer MVPs. Glancing at mainstream media coverage, the consensus seems to be that this season's MVP race is a two man contest between Giannis Antetokounmpo and James Harden. I am baffled, but not surprised. The 40-13 Milwaukee Bucks have the best record in the league largely because of the all-around prowess of Giannis Antetokounmpo, who is averaging 26.7 ppg (eighth in the league), 12.6 rpg (seventh in the league) and a team-high 5.9 apg. A good argument could be made that Antetokounmpo is the best all-around player in the league, which is the primary criterion I consider when evaluating MVP candidates. He is an elite scorer, rebounder, passer and defender. If being the best player on the best team is the MVP standard, how can Antetokounmpo not be considered the clear favorite at this point of the season? Last season, the Bucks had the seventh best record in the East. No one expected the Bucks to be this good this season. When the Phoenix Suns exceeded expectations and posted the NBA's best record in 2004-05, Steve Nash won the regular season MVP despite averaging just 15.5 ppg (fourth on his own team) and having no impact whatsoever defensively. Voters were so impressed by what they perceived his impact to be that they gave him the MVP the next season as well, even though the Suns did not post the best regular season record. Nash won the first MVP ahead of Shaquille O'Neal (who he edged out 65-58 in terms of first place votes), Dirk Nowitzki, Tim Duncan, Allen Iverson and a young (but already impactful) LeBron James; Nash won the second MVP ahead of James, Nowitzki, Bryant and Chauncey Billups. In 2005-06, Bryant won the scoring title with the highest average (35.4 ppg) since Michael Jordan scored 37.1 ppg in 1986-87 and Bryant carried a team with non-NBA level players Kwame Brown and Smush Parker starting at center and point guard, traditionally the two most important positions. Bryant received 22 first place votes, second only to Nash's 57, but Bryant slipped to fourth overall because many voters did not even rank Bryant in the top five! Ostensibly, this was because Bryant's team did not win enough. Based on that precedent, if the voters are going to be consistent then they can never give the MVP to a player whose team does not finish in the top five in wins, because it is hard to imagine a player ever having a better, more explosive season than Bryant did in 2006 and then not only not winning the MVP but being left entirely off of many ballots. That brief tour down memory lane takes us directly to James Harden, who is scoring a league-high 36.5 ppg for the Houston Rockets, who currently have the fifth best record in the Western Conference and the 10th best record in a 30 team league. The Rockets started the season slowly, as Harden showed up in less than optimal shape, and although they have played better recently they are 6-4 in their past 10 games even as Harden keeps setting scoring records. Harden remains a subpar defender, and his offensive numbers are indisputably inflated by (1) his team's style of play (every lead guard who plays for Mike D'Antoni--going all the way back to Nash--has inflated numbers relative to what he did/would do in a more conventional system), (2) rules changes that favor perimeter offensive players and (3) the inexplicable but undeniable facts that (a) Harden is permitted to blatantly travel on his patented "step back" move and that (b) Harden is awarded free throws on plays that do not result in free throws for any other offensive player. Harden is officiated so much differently than any other player that opposing players have taken to putting their hands behind their backs when guarding Harden so that referees do not have the slightest excuse to call a foul, but of course such "defense" enables Harden to shoot uncontested shots that any competent NBA player can make without difficulty. The context in which Harden is equaling or surpassing marks set by Wilt Chamberlain, Michael Jordan and Kobe Bryant is farcical, and bears no relationship to the context in which those records were set, when players were allowed and even encouraged to play defense and when offensive players were required to at least loosely adhere to the rule against traveling. Harden is without question a talented scorer but the perfect storm of factors listed above has transformed him into a record-setting scorer--but even with him setting records left and right his team is still not a legit contender well past the halfway mark of the season. When Bryant and Jordan averaged 35-plus ppg they were also All-Defensive Team performers (unlike Harden) but even that was not enough to ensure an MVP (Jordan did not win in 1987 but in 1988 he won his first MVP after his second 35 ppg season, when he also earned the Defensive Player of the Year award and his Chicago Bulls won 50 games, third best in the East). Barring a tremendous jump in performance by Houston down the stretch, an MVP award for Harden would fly in the face of the historical precedents established when Jordan and Bryant did not win MVPs as 35 ppg scorers who had games that were more complete and fundamentally sound than Harden's. Of course, a flawed precedent should not be followed but the point is there is not a rational set of criteria by which Harden would finish first: he is not the best player on the best team, he is not the best all-around player and he is not better than previous top performing players for non-contending teams who did not win MVPs. On what basis does it make sense to place Harden ahead of Anteokounmpo? If the MVP race were decided by the criteria that I value, the leading candidates would be Anteokounmpo, Russell Westbrook, Kevin Durant and Paul George. LeBron James, Kawhi Leonard and Stephen Curry are each playing at an MVP level but have missed too many games to qualify (barring exceptional circumstances/performance, an MVP should play at least 70 out of 82 regular season games). What about Harden? We have already seen this movie before, albeit with slightly less pyrotechnics, but we know that Harden's gimmicky game does not translate well into the playoffs. Why should that matter when voting for a regular season award? The answer is that this is not just any award but rather the most prestigious individual award and likely the first line on a player's Hall of Fame resume, along with championships won/Finals MVPs won. Harden is a high level "looter in a riot," doing things in the regular season that (1) are not translating into his team having top five status during this season and (2) will almost certainly not translate into postseason success. Does Harden belong on the select list of players who have won an NBA regular season MVP, let alone the even more select list of two-time winners? I don't buy it. I realize this is a minority opinion and I am OK with that. I have been providing minority opinions here on many issues for well over a decade and history has vindicated the vast majority of those opinions. Antetokounmpo's MVP resume is listed above. It should be added that he has superior size, speed, agility and ball-handling skills. He is a taller version of Scottie Pippen who looks for his own shot a little more than Pippen did. Westbrook has been the most underrated great player in the league for several years and the gap between his playing level/the perception of his playing level is growing each year. On Tuesday night, Westbrook had 16 points, 15 rebounds and 16 assists as his Oklahoma City Thunder beat the Orlando Magic, 132-122. That was Westbrook's seventh career 15-15-15 game, tied with Wilt Chamberlain for second on the all-time list behind Oscar Robertson, who accomplished the feat 14 times. Westbrook has posted seven straight triple doubles, averaging 20.0 ppg, 13.2 rpg and 14.4 apg during that streak as his Oklahoma City Thunder went 6-1 while scoring 124.6 ppg. The Thunder have the third best record in the Western Conference. This is the third time that Westbrook has had a triple double streak of seven games, tying Michael Jordan and Oscar Robertson (who each did it just once) for second all-time behind only Wilt Chamberlain, who once had a streak of nine consecutive triple doubles. Westbrook has averaged a triple double in each of the past two seasons and is averaging a triple double this season as well. Prior to Westbrook, Robertson was the only player to average a triple double in a season (1961-62; he also averaged an aggregate triple double during his first five NBA seasons). The NBA community is acting like averaging a triple double for multiple seasons is no big deal, while simultaneously lavishing praise on Harden for scoring tons of points when no one is permitted to be within a foot of Harden without being whistled for a foul. Oklahoma City Coach Billy Donovan is baffled that Westbrook's triple doubles feats are largely being ignored: "I think it's crazy that anybody is devaluing that in my opinion. Oscar Robertson did it for a season and it hadn't happened again in 60 years. (Westbrook) is in the process of doing it three consecutive years, so just that is something in and of itself that has not happened in the history of the game. He impacts our team in so many different ways." Westbrook's teammate Paul George--who defied the expectations of the "experts" and re-signed with the Thunder as opposed to going to the L.A. Lakers to play with LeBron James--declared that Westbrook is the main reason that the Thunder's offense so explosive: "He is definitely the reason for that. He is the reason we have had the highest (offensive) months in Thunder history. I cannot say enough for the credit he deserves for our offense being at the level it is at." Westbrook is the best all-around player in the NBA--no player possesses his unique combination of scoring, rebounding and passing skills--but I would rank Antetokounmpo ahead of Westbrook now because Antetokounmpo is so much bigger. Size matters in the NBA and even if one argues that Westbrook's triple double skill set may be better than Antekounmpo's skill set, size is the decisive tiebreaker. There is every reason to believe that both players can and will play the same way during the postseason. Kevin Durant has won the last two Finals MVPs, outdueling LeBron James, who is the best all-around player in the league when he is healthy. This season, Durant is averaging 27.5 ppg (fifth in the league), 7.1 rpg and a career-high 6.0 apg. He is an unguardable player who can score from anywhere on the court, though he is more effective facing the hoop than playing with his back to the basket, despite being 7 feet tall (or very close to that, regardless of what height he is listed at). Durant has been the most productive player for a Golden State team that has the best record in the Western Conference; his running mate Stephen Curry has a slightly higher scoring average but Curry has played in 11 fewer games and has less of an impact than Durant in every area of the game other than scoring. If Curry had not missed as many games as he has then he would certainly deserve to at least be in the MVP conversation but this year he does not make the cut. Paul George is the most intriguing player on my 2019 regular season MVP short list. His game and impact are consistently misunderstood by most analysts. First, they widely assumed that he would leave Oklahoma City last summer to join forces with LeBron James in L.A.; the media seems to have difficulty grasping the concept that many players do not want to have anything to do with the drama that inevitably comes with playing alongside James, who thinks nothing of throwing coaches and teammates under the bus. Then, after George stayed with the Thunder and played some of the best ball of his career during the first half of this season, the media--instead of crediting Westbrook for "making his teammates better," which would have been the narrative if George had played this way alongside James--acted as if George is doing well despite Westbrook and that George has supplanted Westbrook as the Thunder's best player. Right now, Westbrook is 1A and George is 1B, an arrangement that is not uncommon on championship contenders. Westbrook is the engine who makes the team go (reread the above George quote about Westbrook) but George's timely scoring/shotmaking nicely complement Westbrook's all-around game, particularly as Westbrook has struggled with his shot at times this season. George is a Defensive Player of the Year candidate who is also averaging a career-high 28.0 ppg (fourth in the league). George is not nearly the rebounder or playmaker that Westbrook is, and George is more comfortable having Westbrook run the show (which is still the case, even though George is scoring more points), but George is playing at an elite level and deserves to be in the conversation for top five MVP candidates. Barring something unforeseen, the media will turn this into a two candidate race between Antetokounmpo and Harden, with George and Durant receiving some "honorable mention" type consideration and Westbrook probably not getting any votes--but that does not make their presumptive MVP voting pattern this year any more right than it was when they, in their infinite wisdom, gave MVPs to various other players when O'Neal, Bryant and James were more deserving (as was Jordan, in a previous era).